The author provides a thoughtful explanation of the law of free will, the free will from Lucifer’s and ascendant masters’ points of view. The second death (spiritual death) concept is stated and explained in depth. I also enjoyed a description of the complexity of beings – not only human beings (as entities possessing several thin bodies besides the physical one), but also other beings having a different existence and living on the Natural planets. The main reason I read this book was my serious curiosity about Jesus. All my personal guesses about this great spiritual being were confirmed in Kim Michaels’ book and described in detail. That was the most inspiring part of this novel for me. The author described the life of Jesus in the physical body as well as his journey as a spiritual being step by step, including Jesus’ “afterlife” journey and his path to ASCENSION. This story is quite different from what we all know from “official” sources. The technical side of the book has some imperfections. The manuscript is long. It’s written in a sort of free-flow memoir and has repetitive “loose” text. With the help of a professional editor, it could be reduced in length by at least 30 percent without harming the content. In addition to improving the readability, it would be helpful to eliminate the occasional writing errors and misspellings. Another area for improvement is that the book has a “heavy” beginning. It contains several definitions of and abbreviations for the “bad guys” that are neither in line with the title of the book nor used throughout the book except, briefly, in one place. That part could perhaps be condensed in length or removed and placed in a separate book. Approaching the end of the book, I asked myself: What is this book about and what was the author’s main goal in writing it? I concluded that 95 percent of the content described a PROBLEM (i.e., falling beings) while 5 percent described the SOLUTION (i.e., raising a collective consciousness). At the very end of the manuscript, Kim Michaels confirmed my answer – his goal was to deliver comprehensive information about the Darks. This brave explanation of who sets up suffering on Earth is definitely needed. However, just as sickness cannot arise in a pure body, Darks won’t appear at a high level of collective consciousness. In other words, we need inspirational stories that help change the existing situation and a toolkit of HOW TO RAISE CONSCIOUSNESS. I would like Kim Michaels to write a continuation of this book. I wish that 5 percent of the new book would provide information about the PROBLEM (i.e., suffering) and that 95 percent – about the SOLUTION (i.e., how to reach a higher level of collective consciousness and, as a result, our planet’s ascension). Life on the Natural planets; their inhabitants’ goals, objectives, obstacles and challenges with respect to the raising and maintaining of high consciousness; leadership; the role of women. Among the billions of planets in the universe, there must be some that are similar to Earth, that were able to raise their collective consciousness. The factors (with detailed examples) influenced them on their way to achieving it; spiritual choices; leadership and the role of women in raising consciousness. We know that all the 195 countries on Earth have own national mentality representing different levels of collective consciousness and that the gap between the highest and lowest ones is relatively big. Which values have the best nations followed throughout their history to achieve their current level of consciousness? Which spiritual choices have they made, and what can be done to help the nations that are behind? 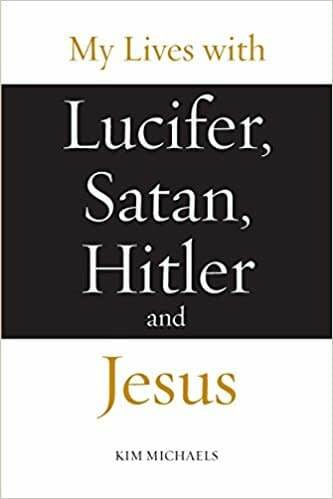 With its courageous and direct approach to many “hidden” topics and its revelation of a mystery about the Darks, the book “My Lives with Lucifer, Satan, Hitler and Jesus” by Kim Michaels is a valuable read for any spiritual seeker.